SQangles the Super Quick Way to Make Half Square Triangles – Multiple Use Iron On Templates for Quilting – No Paper to Tear Off, No Lines to Draw! 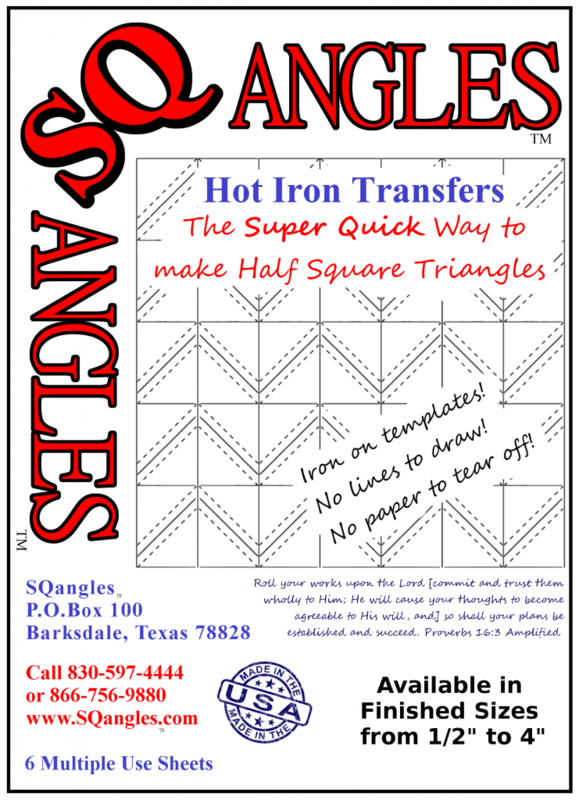 SQangles™ are multi-use iron on templates for quilting – no lines to draw and no paper to tear off – no adding fractions! SQangles™ are the Super Quick way to make half square, quarter square, half quarter square triangles, flying geese and more! SQangles™ make quilting more fun! No paper to tear off! Quick – Easy – Accurate! Place fabrics right sides together and sew on stitching lines. Rotary cut apart on solid lines to separate and then cut on diagonal lines. With the darkest color on top, set the seam with iron then carefully press open. Place two half square triangles, right sides together with fabrics opposite each other and seams parallel. Draw a diagonal line from corner to corner across the seams and sew on the drawn line. Cut away ¼” from the seam, open and press. You now have a quarter square triangle the same size as the half squares you started with. Same as the Quarter Square Triangles except use a plain fabric square in place of one of the half squares. SQangles™are designed for multiple use. For best results use a DRY iron set to the WOOL temperature setting. For delicate fabrics use the recommended settings and a pressing cloth between the iron and the template paper. ALWAYS use a DRY iron when stamping heat transfers. We do not recommend using an iron with an automatic shut-off setting because they do not always maintain a constant temperature. AN ENTIRE SHEET OR STRIPS may be used to make half square triangles. If using strips cut them horizontally (from left to right) in order to sew in a continuous line. For scrap quilts sew a row then cut that row away from the stamped fabric and use another fabric for the next row. PRESS with the lightest color fabric RIGHT SIDE DOWN on ironing surface, place template paper, DESIGN SIDE DOWN on top of WRONG SIDE of fabric. PRESS until all design has been stamped. Heat transfers the design. Use a light hand and let the heat do the work. Try it first with a test design on scrap fabric. It is most important that the paper is not moved during the stamping process. Carefully lift a corner and check stamping. When the design is clearly stamped, remove pattern and save for reuse. Each sheet should be good for several stampings. Important: Some batiks are not suitable for use with SQangles™, due to wax used in the dying process. Transfer ink may be permanent on some fabric, we assume no responsibility for any damage to fabrics.